We are entering our second year of partnership with a fun, free, and truly easy fundraiser called Shoparoo! Schools nationwide are already earning hundreds and even thousands every year through Shoparoo, and it’s a great opportunity for us to really make a difference this year! Select our school from the list. 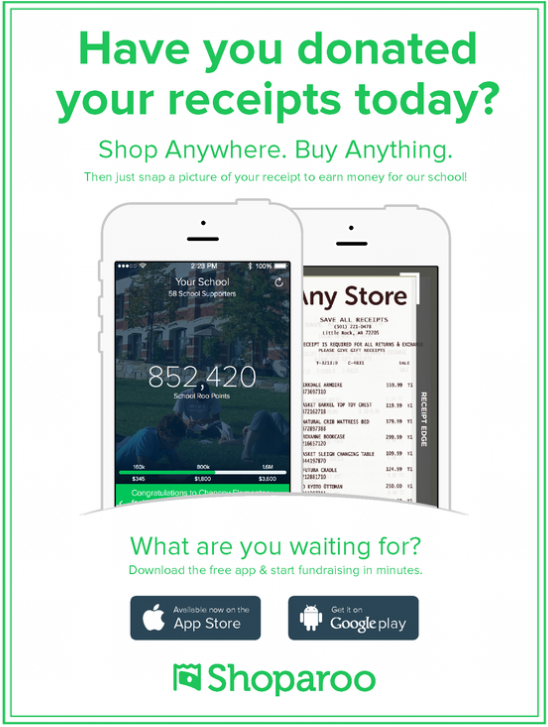 Start taking pictures of your receipts－shop anywhere, buy anything! Grocery receipts earn cash donations; non-grocery receipts earn sweepstakes entries. ​You can even select a grade to support and have fun with grade competitions! There’s no limit to how much money we can raise with Shoparoo－the more supporters, the more we will raise for our school. Schools with just 40 supporters are earning an average of $1,000 every year. That’s free, easy money that we could be fundraising too. Check out shoparoo.com to learn more about this awesome app! ​Questions about Shoparoo? Contact the Rewards/Loyalty Committee here.